Six years ago today was one of the best days of my life. Well, maybe the actual day wasn't that great. It started with abdominal surgery, after all. But it was the day I became a mom, which makes it one of the best days ever. We learned Baby was breech about two weeks before his due date. I underwent a procedure to try to turn him, which was both incredibly painful and unsuccessful. I was devastated. After weeks of childbirth classes and all the other preparations, we weren't planning on a c-section. But it went smoothly and that's all that mattered. We weren't allowed to take pictures in the operating room, so there aren't any photos of his actual delivery, or him being weighed and measured. Instead, the first picture of our son was taken in my post-surgery recovery room. Beautiful. Perfect. Me, not so much. 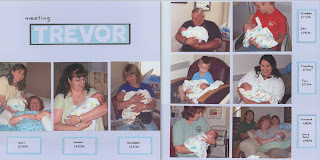 Family and friends were eager to visit us in the hospital and meet Baby. I had gotten it in my head that no one would be allowed to learn Baby's name until they came to meet him in person. I knew that while I was being stitched up and sent to recovery, Steve would be the one phoning family members one by one to let them know the baby had arrived. I didn't want to miss being there to reveal the name and hear everyone's reactions. So the title "Introducing Trevor" really means exactly that. We ended up staying in the hospital for 5 days. Trevor was cleared to go on the 4th day, but we chose to stay an extra day. I've heard a lot of people say they couldn't wait to get out of the hospital and get home, but I was the exact opposite. I had a wonderful experience. Steve had a harder time- he stayed by my side the entire time, except for the few minutes each day he foraged for food in the cafeteria. He slept on the pull-out chair next to my bed. He did all the diaper changes and held Trevor nearly every minute that I wasn't breastfeeding. A perfect new Daddy. Happy birthday Trevor! These past 6 years have been the best years of my life. I love you! Awwwwww! Happy birthday Trevor! What a great story on his name being introduced and what a beautiful lo!!! I love seeing the pictures from that first week. It brings back so many good memories (well, except for my hair!). You and Steve are such awesome parents! Happy Birthday, Trevor! I've wondered this before too! I just did a little research. It might be due to the size of the image. If it's too large or too small, it won't enlarge. If it's within a certain size range, it will enlarge. I'm not sure if this is the case or what I can do about it, short of deleting, resizing, and re-uploading all my pictures, which I obviously don't want to do. I can't even imagine how long that would take. Oh, big birthday wishes to Trevor. Great stroll down memory lane. 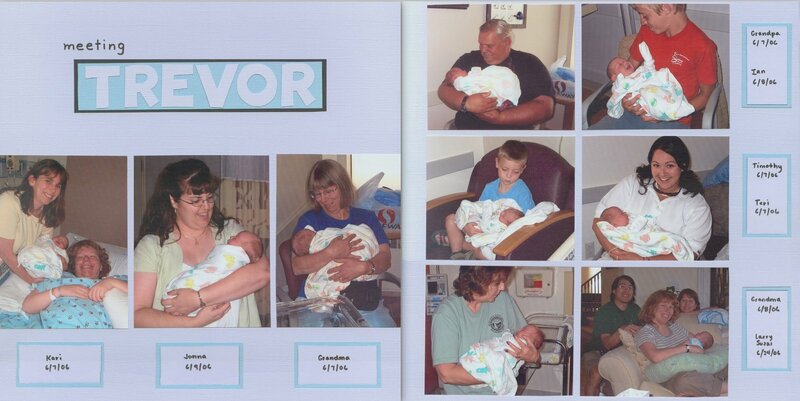 So wonderful that you got pics of each person holding him. So sweet.